The Clear Path Mala Necklace features white / grey Howlite gemstones along with chestnut brown Madre de Cacao wood and a soft yellow Citrine pendant to boost your awareness, enhance mental function and increase will power so you can move forward with clarity, confidence and ease. 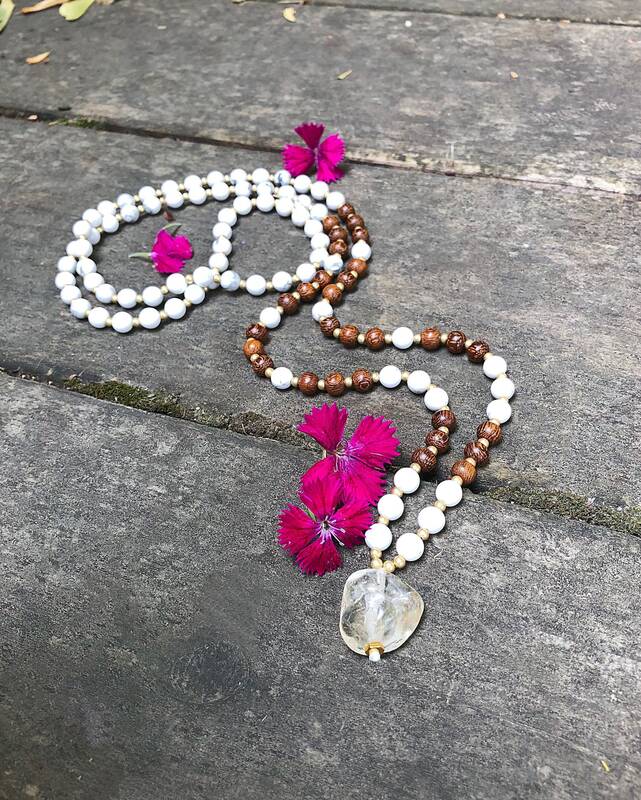 This beautiful mala captures the light when you move, adding a little extra sparkle and magic. *Each Citrine focal bead will be slightly different in size, shape and color tone (since no two gemstones are alike) but we do our best to choose one as close to the photo as possible. Howlite is an extremely calming gemstone that can ease frustration, stress, self-criticism and anxiety. It is especially helpful for an overactive mind. It instills patience and helps to eliminate rage and uncontrolled anger. Wearing Howlite can absorb your own anger and any that is directed toward you. In meditation, it links into the spiritual dimensions, opening attunement and preparing your mind to receive wisdom and insight from your higher self and the Divine. It can help you release attachments that no longer serve you. It may also help relieve insomnia. Madre de Cacao is a very hard tropical wood that symbolizes development, evolution, adaptation, and growth. The visible intricate wood grain feels and looks gorgeous against the skin. Wonderful for use in meditation or for daily wear. 6mm natural wood and gemstones, strung on strong hemp cord. No stretch (or very little).